There is nothing more lovely than waking up on a Saturday morning (without the alarm going off) realising it is Saturday morning (yippee no work), knowing that Sunday follows Saturday (yippee still no work), remembering that you did all the housework in the previous two days (the joys of working from home meaning you can get the boring stuff done in between work) so realising that the next 48 hours are just yours for stitching 🙂 Added to that the fact that next week is the end of term with a couple of Christmas dos to attend and then I am on holiday! And I have discovered (and made) a new Christmas ornament which is will share with you in a minute – I may just be the happiest bunny on the planet!!! Plus my lovely son has returned from University for the holidays so not only is it very nice to spend time with him (and lovely daughter from next weekend) but he very kindly does the stuff like vacuuming, popping to the shops and jobs that need a tall person. First the important task of telling you who won the giveaway for my 7th blogaversary. Thanks to the random number generator the winner is ‘Like number 3’ who is Pam in the UK. 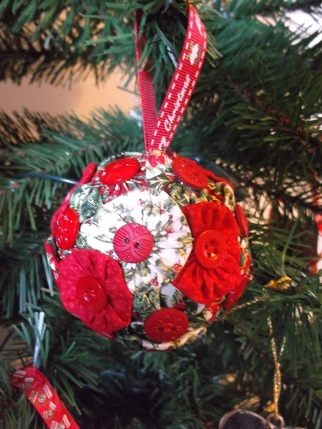 Please could you e-mail me at alisonmryan@yahoo.co.uk with your address so I can send your ornaments out. Thanks as well to everyone else who liked and for all the lovely comments. 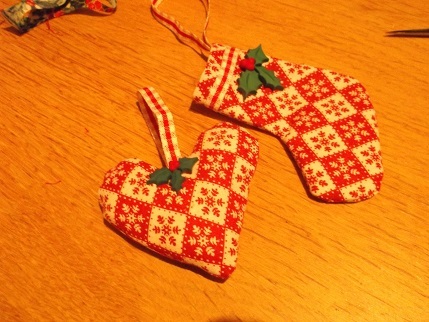 We had another little ornament making session recently (or Crafternoon as Sharon discovered they are now called from my new Simply Crochet magazine). Helen, Sharon and Sammy from knitting group came for an afternoon of festive making and a little bit of fizz! Apologies for the bad light, it was actually sleeting most of that day, but here are Sharon and Helen discussing the all important issue of which buttons would look best on Helen’s heart and stocking. She used some Scandi fabric in my stash to make these. Here is my work in progress picture. I was actually looking for instructions on how to make a Suffolk Puff Christmas tree when I found this very cute idea. 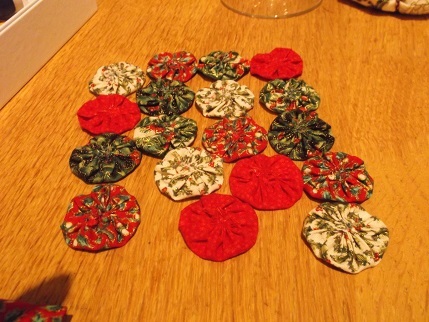 I cut out all of my puff circles to 2 and a half inches originally, sewed them up and attached buttons to cover the hole and then pinned them on to a polystyrene bauble (2 small pins underneath each button) whereas the original tutorial says to sew them together round an ordinary bauble but that looked a bit tricky. I may well have to make a whole load more of these (probably not before Christmas) but this could well be next year’s gift bauble to friends and family as it is so cute! In my searching for Suffolk Puff Inspiration I found this lovely blog, Potter, Wright and Webb that looks at all sorts of traditional crafts from the UK which I thought may be of interest. So I do hope you are going to have an equally lovely weekend, I have now got to go and put the pedal to the metal (sewing machine not car) to finish up presents that need to go in the post on Monday. That’s a lovely little bauble! You have prepared really well for Christmas. The little buttons are looking beautiful and give an extraordinary look to the designs. I am in progress of completing my design for this festive season and will try to use small buttons in my design to make them more attractive. Anyways, enjoy the holiday season and Happy Christmas to you.